Indianapolis (CNN) — Let’s just come out and say what a lot of people are thinking this Super Bowl weekend: Indianapolis? Really? Hard-core fans who blow wads of cash every season to get their championship tickets punched want to know: Has the NFL reached a point when this iconic face-off between our national gladiators can be hosted by any team city? Even a cold-weather, landlocked, midsize burg surrounded by corn and guided by a mysterious force called “Hoosier Hospitality”? Because, sorry sports fans, let’s be real: This ain’t New Orleans, Miami or Southern California — or any of the sunshiny February playgrounds that have dominated location choices for 45 years. After decades of strategizing, planning and selling the city to NFL team owners, Indy says it’s ready to host Super Bowl XLVI. “It’s the pinnacle,” said former Mayor Bill Hudnut, who started the campaign rolling in the early ’80s. Without a doubt, preparations have transformed the town’s look and feel. The community has poured hundreds of millions of taxpayer dollars and corporate coin to build new hotels, spruce up landscaping and resurface miles of streets. As a result, a sea of Patriots blue, Giants blue and Colts blue has been flowing through the downtown area — now dubbed Super Bowl Village. More than 300,000 have walked through the neighborhood in the past week, officials said. Former Colts head coach Tony Dungy told CNN affiliate WRTV-TV that the city is putting “its best foot forward.” The fans are “going to be pleasantly surprised,” he said. Restaurants, hotels and the village all surround Lucas Oil Stadium — creating a compact, walkable Super Bowl district that veterans say is unique to almost all previous venues except perhaps New Orleans. “I think the setup here is fantastic,” NFL Commissioner Roger Goodell told WRTV. Indianapolis streets have been renamed for each of the NFL teams such as Dolphin Drive. Does Indianapolis have to prove anything by hosting the game? Is this about some kind of cornfed inferiority complex that Hoosiers have been trying to shake for decades? It’s all a little shocking for those who remember what this neighborhood was like 30 years ago. There wasn’t much here. For workers at the old brick-walled Hurst’s HamBeens building on McCarty Street — a stone’s throw from the stadium — there were no bars or nightspots for hanging out after quittin’ time. Downtown traffic has been diverted around the city’s Super Bowl Village, a compact, walkable district. The image of Manning’s face looms large on a building-size Papa John’s banner in Super Bowl Village. Fourteen years after Manning joined the Colts, Americans are indeed talking about the $90 million quarterback. Specifically, they’re talking about his neck. Manning’s recovery from neck surgery — perhaps the most talked about neck in the history of sports — threatens to overshadow Sunday’s game, which will feature Manning’s brother Eli as quarterback for the Giants. 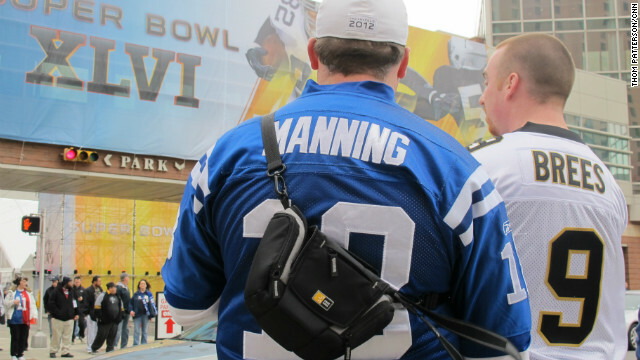 Coverage of Peyton Manning’s recovery from neck surgery threatens to overshadow Super Bowl XLVI. Most people know the injury forced Peyton Manning to sit out the Colts’ entire season, resulting in two wins and 14 losses — a stinking record after 2010’s 10-6 season. Now the Colts face an epic decision about whether to pay Manning a $28 million bonusto stay on the team or to cut him loose as a free agent. 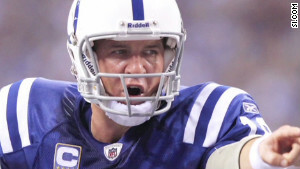 Has Manning played his last game with the Colts? Indianapolis had its own epic decision to make in the early ’80s. At the time, the city had no NFL team. Yet Hudnut, then the mayor, greenlit construction of a $77 million-domed football stadium. Indy was putting out bait to lure the NFL. Before the stadium was finished, the Colts had agreed to move from Baltimore to Indy, triggering a generation of hatred among the Maryland city’s fans over the “theft” of their storied franchise. It was a major step toward using sports to crank up Indy’s status and economic standing. Soon the city was hosting NCAA basketball’s Final Four and the NBA All-Star Game. “Gradually in the ’80s and ’90s people who knew the city regarded Indianapolis as quite a town — even though people who didn’t know Indy still thought of it as a brickyard and a cornfield,” Hudnut said. 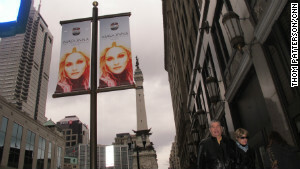 Images of Madonna abound in Indianapolis promoting the singer’s performance as halftime headliner. Fast-forward to Sunday when perhaps more than 112 million people will watch the NFL world championship “taking place in little old Indianapolis,” said Griswold, the radio host. Mission accomplished. The hosting seems to be going well so far — thanks in part to unusually warm temperatures in the low 50s at a time when it’s usually a few degrees above freezing. “We’re loving it. I had to get out here in the village and see everybody!” Boyce said. Indy is the first “cold-weather” host city since Minneapolis-St. Paul in 1992. In 1982, Detroit opened the door to cold-weather Super Bowl hosting. The game returned to the Motor City 24 years later. New York is scheduled for 2014. “Our plan was to eventually get into the rotation for future Super Bowls,” Hudnut said. The village — a $12 million, three-block, “family-friendly festival” with shops and restaurants — has been built not just for Sunday, but for the future. “After the fans have long gone, other people are going to be able to come in and use this space for decades,” Boyce said. What’s getting the most attention? The zip line is the talk of the town. For $10, you can climb the zip line’s 95-foot tower, attach yourself to a metal cable and fly 80 feet above the crowd to another tower 650 feet down the street. “It’s the new version of the bungee jump,” one woman said. Fans reported the wait last Sunday for the zip line was seven hours. That’s almost as long as TV’s Super Bowl pregame show. 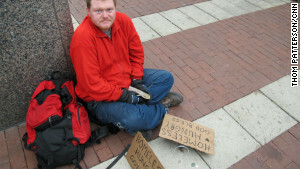 Justin Baranowski says police have been forcing him to move away from the Super Bowl Village because he’s homeless. But not everyone in Indianapolis is awaiting the big game. Justin Baranowski, 33, a homeless man from California, said, “Starting at the end of last week the police started pushing us away from certain areas that we’re allowed to be in,” including the Super Bowl Village. Authorities insist officers aren’t cracking down because of the game, but they said police are working with private organizations to help get the homeless into shelters. 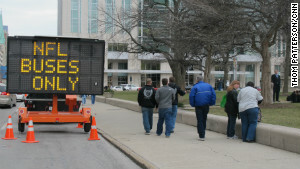 “We’re not moving anyone against their will,” said Marc Lotter, spokesman for Indianapolis Mayor Greg Ballard. The city is sharing its Super Bowl gravy with needy segments of the community. A neighborhood without a grocery store now has a food cooperative thanks to private and NFL funds, Boyce said. Another area received a 20,000-square-foot community youth center, including a gym, classrooms and weekly programs such as cooking, fitness and finance. So what’s next for Indy? A Democratic or Republican national convention may not be out of the question, he said.